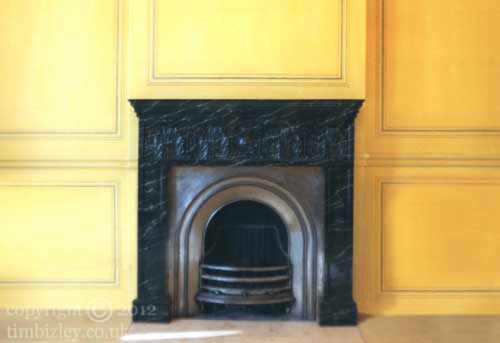 This plaster fire surround has been given a marbleising paint finish in Blue Belge, a hard marble from Belgium. The intensity of the predominantly black marble provides a strong focal point for the room and provides counter point to the trompe l'oeil panel system painted on canvas. The decorative artist is often called upon to replicate marbles with a traditional marbling methods in order to serve the overall requirements of the design scheme. The vast array of existing marble types in multiple colours and textural variations means that in practice there is usually a type of marble extant which can serve the overall scheme. (Canvas panel system by DKT). For interior designer London U.K.